With a 340kg load capacity this folding aluminium Loading Ramp is able to take the weight of almost any motorcycle with ease. Lightweight and easy to transport or stow away. Dimensions: 2170mm x 280mm (when extended). Note: This product is not manufactured by abba, therefor the guarantee on this product is the standard manufactures 1 year guarantee. Foldable to save on space. Capable of loading bikes up to 340kg. Will this take the weight of my bike? 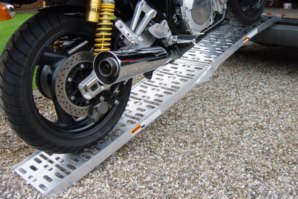 The Loading Ramp will comfortably take any bike up to 340kg. Does the Loading come with a guarantee? Absolutely! However as this product is not manufactured by ourselves the guarantee on this product is the manufactures standard 1 year guarantee. 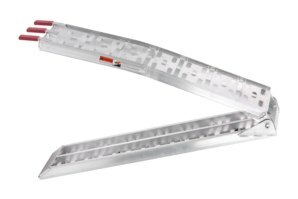 Got a Question about the abba Loading Ramp? If you would like to ask us a question about the abba Loading Ramp, simply fill in the form below and we will contact you within two working days. Want to tell a friend about the abba Loading Ramp? Alternatively fill in the form below and we will send an email on your behalf to your friend, with a link to this page all about the abba Loading Ramp.